Red Army soldiers at a hotel near the Brandenburg Gate, Berlin. Image courtesy of Wikipedia. Thus stars must have aligned perfectly, as the day in which Osama bin Laden was announced dead marks the anniversary of another milestone in the fight against oppression and terror. 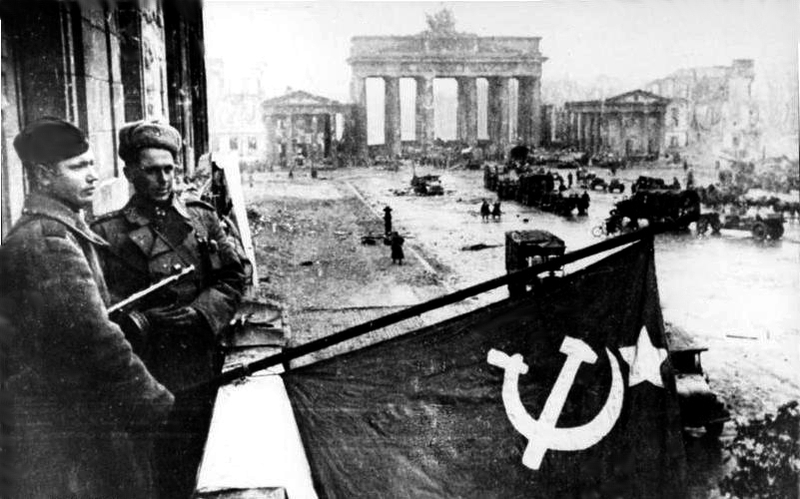 On May 2, 1945, the Red Army finally announces the capture of the German capital of Berlin. With the Soviet flag flying over the Reichstag, the German parliament building, the European theater of World War II was effectively over. At the same time, in the Italian front, German general Heinrich von Vietinghoff signs the documents of surrender, as German forces give up all of Italy to the Allies. Benito Mussolini, Hitler‘s busom buddy, was shot and strung up a few days previously on April 28, and Hitler would meet his own inglorious end on the 30th. Like Osama bin Laden, their deaths were long overdue. Furthermore, the world is a better place without them. Their deaths were met with little saddness: just as today, crowds gathered in London, Times Square, Moscow and other cities to celebrate the end of lives that did far more harm than any good. My grandmother had a soft spot for Mussolini. Good thing she’s not around to hear this: Il Duce was as big a piece of crap as Der Fuhrer, Comrade Stalin, and the turbaned maniac we just double-tapped. We’re a better country–nee, a better planet–without these people.